Why Do Hamsters Run So Much? When you bought your hamster's exercise wheel and set it up, you might not have realized you would be listening to that wheel squeak all night every night as your pet runs on it. Many new hamster owners fail to realize exactly how active their new pets are and how crucial exercise is to the hamster's health. In the wild, hamsters are active most of their waking time. It is completely normal for a hamster to spend the entire night running and gathering food and digging burrows. Like the wild hamster, while he has no need to spend hours hunting for food, your captive one is still biologically programmed to be energetic. Since your hamster is in a cage, he is unable to naturally scurry around and explore like he would in the wild. To get the exercise they need, most hamsters will run in an exercise wheel. According to the American Society for the Prevention of Cruelty to Animals, a hamster can run six miles in a single night on his wheel. Make sure your hamster has a flat-surface wheel, without bars, so his feet cannot get caught between the rungs. Running keeps your hamster fit and healthy -- but the sound of the wheel going around and around can irritate you while you are trying to sleep. 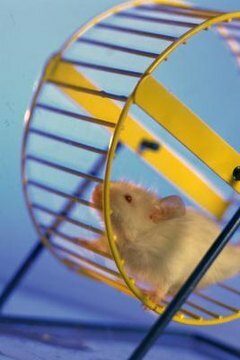 If the sound of the hamster wheel bothers you, move the cage to another room. Do not take your hamster's wheel away. Make sure he has plenty of food and water to keep him happy and hydrated while he exercises. Another way to help your hamster exercise and explore is by placing him in a hamster ball. Hamster balls allow your hamster to play outside his cage without risking losing him. If you decide to let your hamster play in a hamster ball, make sure the lid is on tightly and the ball is always on a flat surface where it cannot fall. You should not leave a hamster in a hamster ball for more than 30 minutes, because he will be at risk of dehydration and overheating. Keeping your hamster in too small of of a cage or not providing him with a hamster wheel can cause paralysis. Hamsters that do not get enough exercise or are unable to run around may begin to lose the ability to move freely. A paralyzed hamster may sit in a hunched position and have difficulty moving his hind legs. Placing your hamster in a larger cage and providing him toys and an exercise wheel will normally reverse this type of paralysis, which is not caused by injury. How Soon After Getting Hamsters Should You Start Putting Them in the Hamster Ball? What Does It Mean When Your Hamster Just Runs Around in Circles All Day? Why Do Hamsters Like Hamster Wheels? What Kind of Wheel Should I Use for My Roborovski Hamster?